CINCINNATI -- Great American Ball Park will offer Reds fans new views and places to buy brews this season. Phil Castellini, the Reds chief operating officer, unveiled ballpark upgrades on Monday, two days before the Reds postponed its Opening Day game against the Washington Nationals from Thursday to 4:10 p.m. Friday due to rain. The first new feature fans will see is not technically in the ballpark, he said. Fans will be able to buy beer, wine and soda at the new Garden Bar at Crosley Terrace before entering GABP. The bar will open when ballpark gates open and stop serving alcohol at the end of the seventh inning. It will also serve $5, 24 ounce Budweiser happy hour beers before the start of each home game. A second new beer vending location, the Budweiser Clydesdale Wagon, also will be located on the terrace this season. The cart will be located near Joe Morgan & Pete Rose statues and serve the same $5 Budweiser beers before games begin. Castellini said fans will be able to bring their beer through the into the ballpark. The Clydesdale Cart will be open two hours before the first pitch and close at the beginning of the game. Inside the ballpark, the Reds expanded the Budweiser Bowtie Bar by adding a second level, which contains its own full-service bar at the end of the right-field line. The second level bar will be open to all ticketed fans. The area also has new reservable Budweiser balconies . The balconies hold 12 loge boxes, which have four seats, private tables and TVs to watch the game on. 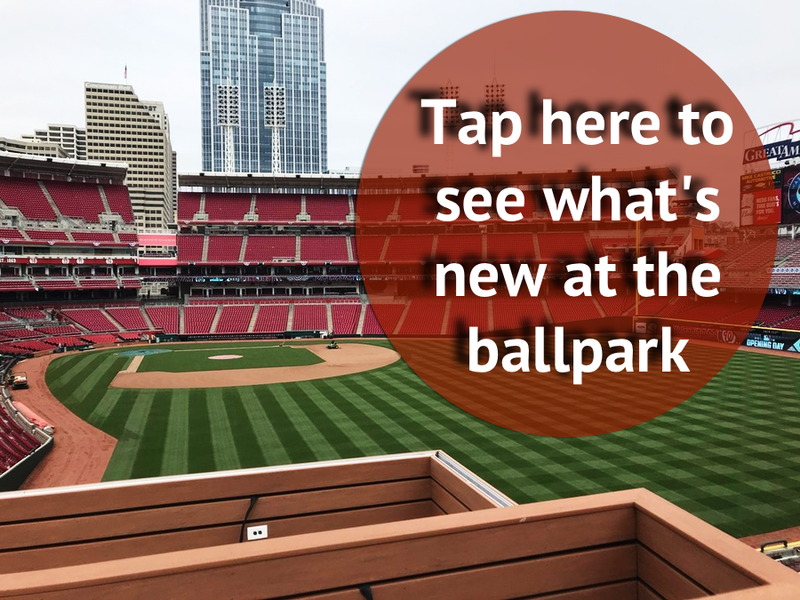 The second level of the new bar provides a rooftop enclosure for the original Bowtie bar, which the Reds upgraded with new TVs and other amenities, Castellini said. And for the first time, the Reds have opened the fully enclosed Center-Field Pavilion, formerly known as the Cincinnati Bell Technology Pavilion. The pavilion will be available for group sales during 40 of the team's home games. Rental packages include an unlimited ballpark buffet, two beers per person, private restrooms, and a view from center field. The space can accommodate 50-115 people and is connected to the Laura’s Lean Bullpen Decks, an open-air tiered area directly above the visitors’ bullpen. The ballpark also has expanded its Ballpark Express mobile food ordering system, which the Reds introduced last season. The technology, designed by local company Apex, allows fans to order and pay for concessions from smartphones and pick up their orders at three locations inside the ballpark. The mobile order pickup kiosks are located in the Kroger Fan Zone, third base Terrace Level and third base View Level. Castellini said people can expect orders to be filled within three minutes. Castellini also showed new retractable safety netting that stretches from behind home plate to the end of the left field. The netting is designed to protect fans from high-speed foul balls.